Summary: "Go tell the Spartans, stranger passing by, that here obedient to their laws we lie." Thus reads an ancient stone at Thermopylae in northern Greece, the site of one of the world's greatest battles for freedom. Here, in 480 B.C., on a narrow mountain pass above the crystalline Aegean, 300 Spartan knights and their allies faced the massive forces of Xerxes, King of Persia. From the start, there was no question but that the Spartans would perish. 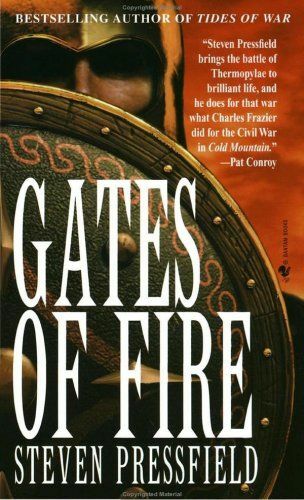 In "Gates of Fire", however, Steven Pressfield makes their courageous defense--and eventual extinction--unbearably suspenseful. In the tradition of Mary Renault, this historical novel unfolds in flashback. Xeo, the sole Spartan survivor of Thermopylae, has been captured by the Persians, and Xerxes himself presses his young captive to reveal how his tiny cohort kept more than 100,000 Persians at bay for a week. Xeo, however, begins at the beginning, when his childhood home in northern Greece was overrun and he escaped to Sparta. There he is drafted into the elite Spartan guard and rigorously schooled in the art of war--an education brutal enough to destroy half the students, but (oddly enough) not without humor: "The more miserable the conditions, the more convulsing the jokes became, or at least that's how it seems," Xeo recalls. His companions in arms are Alexandros, a gentle boy who turns out to be the most courageous of all, and Rooster, an angry, half-Messenian youth. Pressfield's descriptions of war are breathtaking in their immediacy. They are also meticulously assembled out of physical detail and crisp, uncluttered metaphor: The forerank of the enemy collapsed immediately as the first shock hit it; the body-length shields seemed to implode rearward, their anchoring spikes rooted slinging from the earth like tent pins in a gale. The forerank archers were literally bowled off their feet, their wall-like shields caving in upon them like fortress redoubts under the assault of the ram.... The valor of the individual Medes was beyond question, but their light hacking blades were harmless as toys; against the massed wall of Spartan armor, they might as well have been defending themselves with reeds or fennel stalks. Alas, even this human barrier was bound to collapse, as we knew all along it would. "War is work, not mystery," Xeo laments. But Pressfield's epic seems to make the opposite argument: courage on this scale is not merely inspiring but ultimately mysterious. " --Marianne Painter"
My Comments: A historical novel. A fictionalized account of the battle of Thermopylae, as seen through the eyes of one Spartan. This was a fantastic book. Absolutely breathtaking. Rich with detail, vivid, and believable. Told in a way that makes you think it's all true. If you look closely, you'll find that this book is about many things. The one thing that stuck out to me was Democracy. The strength of free men over slaves. The power of Democracy in historical context. Back to the Books Page or / the Front Page of Rob's World!.